We are excited to present you with French children's ebooks through our partnership with storyplayr. 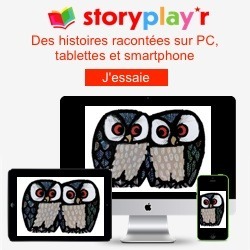 Storyplayr.com is a digital library of illustrated and narrated children's ebooks in French. A subsription to storyplayr provides unlimited access to a digital library of illustrated and narrated books in French and offers parents and children the ability to record their voices as they read a story, to listen to it again later or share it with family living far away. It's currently available on the Mac/PC, IPad and Android tablets. bundled with one of Les Petits Livres's rental plans at a discounted price of $44.99 a year. If you have any questions or feedback, please contact us at customerservice@lespetitslivres.com. To learn more about Storyplay, you can also read this independent review by Michele from IntentionalMama.com.